1.) How many years have you been in coaching and at what age did you start coaching? I have been coaching for fifteen years. I played arena football for the Bayou Bucks and became a player coach around the age of twenty-nine/thirty. 2.) What is the name of the first school you coached at? What other schools have you coached at? The first school I coached at was Istrouma High School in Baton Rouge where I was a teachers aid. Then after six months I took a job as an assistant at Southern University. From their, I went to the Chicago Rush Arena Football team to be the offensive coordinator. Next, I went back to Alcorn State (where I went to college) to be a secondary coach. After Alcorn State, I went to Mississippi to coach at Yazoo City High School. Now, I am here at Bourgeois. 3.) What made you get into coaching? Who or what influenced you the most? Early on I realized I loved coaching and teaching. Even while I was a player, I was always trying to teach and coach the younger players. I was even told to shut up sometimes. My dad has been a high school coach for forty years. He definitely had the most influence on me and my love for coaching. Nothing better than getting to coach high school football in my own state, Louisiana. 4.) Where did you go to high school? What sports did you play if any? My parents met at Clarke High School, so that was where I wanted and did go. I played all kinds of sports: football, baseball, track, and basketball. I grew up in a rough neighborhood and had a lot of chances to get involved in some bad things. Sports saved my life. 5.) Did you go to college? I went to Alcorn State in 1985. I did not graduate because I was going to be drafted. I was drafted 9th round to Kansas City. I bounced around the league for a year or two and went through some trials with some teams. You know what they say NFL stands for? Not For Long. After that and arena football, I went back to Alcorn to get my degree and coach. 6.) Who are some of the best players you’ve ever coached? Drew Himel was a defensive back for the Bayou Bucks. Came straight out of high school from Vanderbilt Catholic high. No one thought he could do much, but he was one of the most fundamentally sound players he has ever seen. Not the most talented, just a great “football” player. Believed in teams only win when they play as a team. Kevin Heard is another one. He was a wide receiver for the bucks. Great with his fundamentals as well. Great player and a great team player. Also believed in team concept. 7.) What would you like to see changed in High School football? I just want to play and do not really worry about the rules. There is a lot of debate between private and public as well as debate on other things. Make sure the rules are fair for both teams and we can play ball and that works for me. 8.) Are there any changes you would like to see in High School football that they have already changed in college ball? Like I said before, I just want to play and make sure the rules are fair. 9.) Do you think the brand of Louisiana football is different than anywhere else? Yes I mean everybody claims they are different, but Louisiana really is. Remember when people said Nick Saban could not win by just recruiting talent in Louisiana? Well now look at him. People (colleges) have been surviving off of Louisiana talent for years. Kids from Louisiana have their own swagger and are different than other kids. We have great football here. 10.) 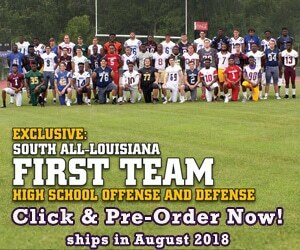 Do you feel like the offense/defense philosophies differ between North and South Louisiana? Maybe a liitle. Teams generally follow trends and specifically trends of winning teams. I really liked some of the things Rummel did. If there is a difference between the North and the South both will be trying to emulate state winners. 11.) Who is your favorite NFL player of all time and why? Jerry Rice. Jerry played in same conference as Alcorn State, my alma mater. I used to idolize alcorn state defensive backs, used to call alcorn state “defensive backs university” and a lot of backs I played with played against Jerry Rice. I loved Alcorn State and played with guys who played against Jerry Rice as well as against guys who played with him. Besides the fact Jerry rice was simply an amazing football player. 12.) Who is your favorite college or pro football coach and why? Bill Belichick- He doesn’t need to talk, professional guy who just wins and know how to win as a team. Nick Saban- I am a defensive guy who enjoys good defensive back play. Nick Saban knows how to coach defensive backs.